Experts at Queen’s University Belfast have designed a flexible and organic alternative to the rigid batteries that power up medical implants. Currently, devices such as pacemakers and defibrillators are fitted with rigid and metal based batteries, which can cause patient discomfort. Dr Geetha Srinivasan and a team of young researchers from Queen’s University Ionic Liquid Laboratories (QUILL) Research Centre, have now developed a flexible supercapacitor with a longer cycle life, which could power body sensors. The flexible device is made up of non-flammable electrolytes and organic composites, which are safe to the human body. It can also be easily decomposed without incurring the major costs associated with recycling or disposing off metal based batteries. The findings, which have been published in Energy Technology and Green Chemistry, show that the device could be manufactured using readily available natural feedstock, rather than sophisticated and expensive metals or semiconductors. Dr Srinivasan explains: “In modern society, we all increasingly depend on portable electronics such as smartphones and laptops in our everyday lives and this trend has spread to other important areas such as healthcare devices. “In medical devices such as pacemakers and defibrillators there are two implants, one which is fitted in the heart and another which holds the metal based, rigid batteries – this is implanted under the skin. Dr Srinivasan adds: “At Queen’s University Belfast we have designed a flexible energy storage device, which consists of conducting polymer – biopolymer composites as durable electrodes and ionic liquids as safer electrolytes. While the findings show that there are many advantages in the medical world, the organic storage device could also provide solutions in wearable electronics and portable electronic devices, making these more flexible. The first paper is open access and the second paper is behind a paywall. This entry was posted in agriculture, electronics, medicine, nanotechnology and tagged Biyun Zhu, Durable Flexible Supercapacitors Utilizing the Multifunctional Role of Ionic Liquids, flexible battery, flexible supercapacitor, Geetha Srinivasan, Intrinsically flexible electronic materials for smart device applications, Marta Lorenzo, medical implants, natural feedstock, organic battery, portable electronic devices, Queen's University Belfast, rigid metal based batteries, wearable electronics on October 24, 2017 by Maryse de la Giroday. Medical implants like stents, catheters and tubing introduce risk for blood clotting and infection — a perpetual problem for many patients. Colorado State University engineers offer a potential solution: A specially grown, “superhemophobic” titanium surface that’s extremely repellent to blood. The material could form the basis for surgical implants with lower risk of rejection by the body. t’s an outside-the-box innovation achieved at the intersection of two disciplines: biomedical engineering and materials science. The work, recently published in Advanced Healthcare Materials, is a collaboration between the labs of Arun Kota, assistant professor of mechanical engineering and biomedical engineering; and Ketul Popat, associate professor in the same departments. Kota, an expert in novel, “superomniphobic” materials that repel virtually any liquid, joined forces with Popat, an innovator in tissue engineering and bio-compatible materials. Starting with sheets of titanium, commonly used for medical devices, their labs grew chemically altered surfaces that act as perfect barriers between the titanium and blood. Their teams conducted experiments showing very low levels of platelet adhesion, a biological process that leads to blood clotting and eventual rejection of a foreign material. A material “phobic” (repellent) to blood might seem counterintuitive, the researchers say, as often biomedical scientists use materials “philic” (with affinity) to blood to make them biologically compatible. “What we are doing is the exact opposite,” Kota said. “We are taking a material that blood hates to come in contact with, in order to make it compatible with blood.” The key innovation is that the surface is so repellent, that blood is tricked into believing there’s virtually no foreign material there at all. The undesirable interaction of blood with foreign materials is an ongoing problem in medical research, Popat said. Over time, stents can form clots, obstructions, and lead to heart attacks or embolisms. Often patients need blood-thinning medications for the rest of their lives – and the drugs aren’t foolproof. 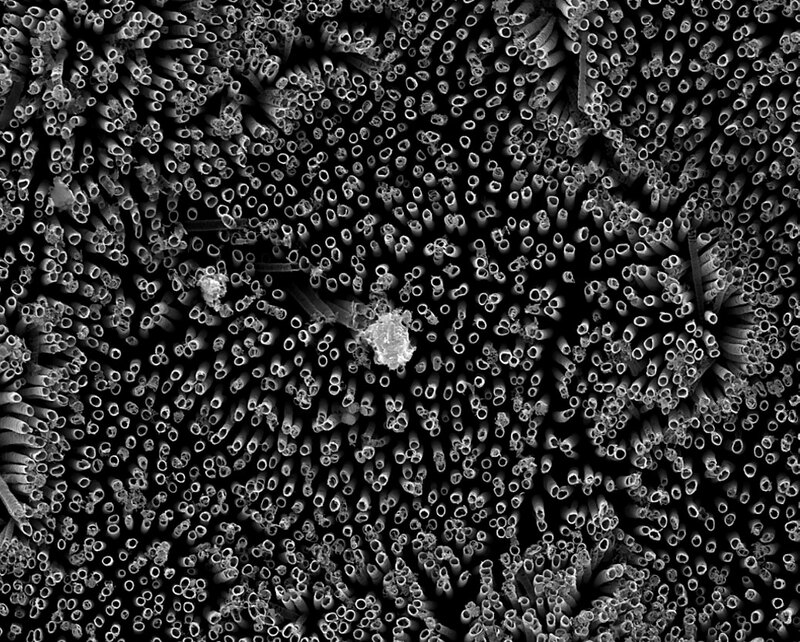 Fluorinated nanotubes provided the best superhemophobic surface in the researchers’ experiments. The researchers analyzed variations of titanium surfaces, including different textures and chemistries, and they compared the extent of platelet adhesion and activation. 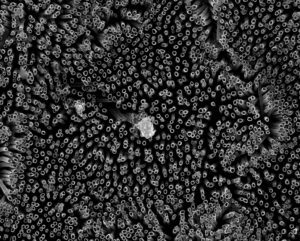 Fluorinated nanotubes offered the best protection against clotting, and they plan to conduct follow-up experiments. Growing a surface and testing it in the lab is only the beginning, the researchers say. They want to continue examining other clotting factors, and eventually, to test real medical devices. This entry was posted in medicine, nanotechnology and tagged Anne Ju Manning, Arun K. Kota, Arun Kota, bio-compatible materials, blood clotting, catheters tubing, Colorado State University, fluorinated nanotubes, Hemocompatibility of Superhemophobic Titania Surfaces, infection, Jonathan A. Sorkin, Ketul C. Popat, Ketul Popat, Lakshmi P. Dasi, medical implants, repellent to blood, Sanli Movafaghi, stents, superhemophobic, superhemophobic titanium surface, superomniphobic materials, surgical implants, titanium, Victoria Leszczak, Wei Wang on February 7, 2017 by Maryse de la Giroday. This entry was posted in coatings, medicine, nanotechnology and tagged anti-adhesives, anti-biofilm coating, Ariel Kushmaro, Ben-Gurion University of the Negev (BGU), Dorit van Moppes, Israel, Karina Golberg, medical devices, medical implants, Noa Emuna, Novel Anti-Adhesive Biomaterial Patches: Preventing Biofilm with Metal Complex Films (MCF) Derived from a Microalgal Polysaccharide, prevention of aquatic biofouling, Robert S. Marks, Shoshana Malis Arad, surgical equipment, T. P. Vinod on April 28, 2016 by Maryse de la Giroday. There’s been a lot of talk about foldable, stretchable, and/or bendable electronics, which is exciting in itself but I find this work on developing a fatigue-free conductor particularly intriguing. After all, who hasn’t purchased something that stretches, folds, etc. only to find that it becomes ‘fatigued’ and is now ‘stretched out’. Researchers have discovered a new stretchable, transparent conductor that can be folded or stretched and released, resulting in a large curvature or a significant strain, at least 10,000 times without showing signs of fatigue. This is a crucial step in creating a new generation of foldable electronics – think a flat-screen television that can be rolled up for easy portability – and implantable medical devices. The work, published Monday [Sept. 21, 2015] in the Proceedings of the National Academy of Sciences, pairs gold nanomesh with a stretchable substrate made with polydimethylsiloxane, or PDMS. The research is the result of an international collaboration including the University of Houston (US), Harvard University (US), Methodist Research Institute (US), Zhengzhou University (China), Lawrence Berkeley National Laboratory (LBNL; US). The substrate is stretched before the gold nanomesh is placed on it – a process known as “prestretching” – and the material showed no sign of fatigue when cyclically stretched to a strain of more than 50 percent. The gold nanomesh also proved conducive to cell growth, indicating it is a good material for implantable medical devices. Fatigue is a common problem for researchers trying to develop a flexible, transparent conductor, making many materials that have good electrical conductivity, flexibility and transparency – all three are needed for foldable electronics – wear out too quickly to be practical, said Zhifeng Ren, a physicist at the University of Houston and principal investigator at the Texas Center for Superconductivity, who was the lead author for the paper. The new material, produced by grain boundary lithography, solves that problem, he said. In addition to Ren, other researchers on the project included Chuan Fei Guo and Ching-Wu “Paul” Chu, both from UH; Zhigang Suo, Qihan Liu and Yecheng Wang, all from Harvard University, and Guohui Wang and Zhengzheng Shi, both from the Houston Methodist Research Institute. In materials science, “fatigue” is used to describe the structural damage to a material caused by repeated movement or pressure, known as “strain cycling.” Bend a material enough times, and it becomes damaged or breaks. That means the materials aren’t durable enough for consumer electronics or biomedical devices. “Metallic materials often exhibit high cycle fatigue, and fatigue has been a deadly disease for metals,” the researchers wrote. Many applications require a less dramatic stretch – and many materials break with far less stretching – so the combination of a sufficiently large range for stretching and the ability to avoid fatigue over thousands of cycles indicates a material that would remain productive over a long period of time, Ren said. The grain boundary lithography involved a bilayer lift-off metallization process, which included an indium oxide mask layer and a silicon oxide sacrificial layer and offers good control over the dimensions of the mesh structure. The researchers used mouse embryonic fibroblast cells to determine biocompatibility; that, along with the fact that the stretchability of gold nanomesh on a slippery substrate resembles the bioenvironment of tissue or organ surfaces, suggest the nanomesh “might be implanted in the body as a pacemaker electrode, a connection to nerve endings or the central nervous system, a beating heart, and so on,” they wrote. This entry was posted in medicine, nanotechnology and tagged Au (gold), China, Ching-Wu “Paul” Chu, Ching-Wu Chu, Chuan Fei Guo, fatigue, Fatigue-free, fatigue-free conductor, foldable electronics, gold nanomesh, Guohui Wang, Guohui Wang Zhengzheng Shi, Harvard University, Houston Methodist Research Institute, Jeannie Kever, Lawrence Berkeley National Laboratory, LBNL, material fatigue, medical implants, poly(dimethylsiloxane) (PDMS), Qihan Liu, Qihan Liu Yecheng Wang, strain cycling, stretchable conductor, superstretchable transparent and biocompatible metal electrodes, transparent conductor, University of Houston, US, Yecheng Wang, Zhengzheng Shi, Zhengzhou University, Zhifeng Ren, Zhigang Suo on September 29, 2015 by Maryse de la Giroday. I know someone who suffered a deep bone infection after some dental work. Devastatingly, she lost bone material as a consequence and it took years, more than one surgery, and multiple sessions in a hyperbaric chamber to recover, more or less. Leading scientists at the University of Sheffield have discovered nanotechnology could hold the key to preventing deep bone infections, after developing a treatment which prevents bacteria and other harmful microorganisms growing. The pioneering research, led by the University of Sheffield’s School of Clinical Dentistry, showed applying small quantities of antibiotic to the surface of medical devices, from small dental implants to hip replacements, could protect patients from serious infection. Scientists used revolutionary nanotechnology to work on small polymer layers inside implants which measure between 1 and 100 nanometers (nm) – a human hair is approximately 100,000 nm wide. Lead researcher Paul Hatton, Professor of Biomaterials Sciences at the University of Sheffield, said: “Microorganisms can attach themselves to implants or replacements during surgery and once they grab onto a non-living surface they are notoriously difficult to treat which causes a lot of problems and discomfort for the patient. “By making the actual surface of the hip replacement or dental implant inhospitable to these harmful microorganisms, the risk of deep bone infection is substantially reduced. Bone infection affects thousands of patients every year and results in a substantial cost to the NHS. Treating the surface of medical devices would have a greater impact on patients considered at high risk of infection such as trauma victims from road traffic collisions or combat operations, and those who have had previous bone infections. Professor Hatton added: “Deep bone infections associated with medical devices are increasing in number, especially among the elderly. This entry was posted in coatings, medicine, nanotechnology and tagged Cheryl A. Miller, deep bone infection, dental implants, Functionalised nanoscale coatings using layer-by-layer assembly for imparting antibacterial properties to polylactide-co-glycolide surfaces, Graham J. Leggettc, Graham P. Stafford, Mar Cardellach, Maria E. Frongia, medical implants, Paul V. Hatton, Piergiorgio Gentile, UK, University of Sheffield on June 1, 2015 by Maryse de la Giroday. Publishing their findings in the latest issue of Materials Today, a team of researchers from Germany and Austria explain how conventional sterilization techniques based on a blast of radiation, or exposure to toxic gas can damage the functional biological components of the device. The coating, containing a component found in liquorice and developed by German biotech company LEUKOCARE AG, protects these sensitive components. Joachim Koch of the Georg-Speyer Haus, Institute for Biomedical Research in Frankfurt am Main in Germany and colleagues explain how medical devices and implants are increasingly functionalized using pharmacologically active proteins, antibodies and other biomolecules. Harsh sterilization procedures, including beta and gamma irradiation or exposure to toxic ethylene oxide can damage these sensitive molecules and render the device useless. However, without sterilization the patient is at risk of infection when the device is used or implanted. The team has now successfully evaluated the nano-coating; a technology which employs a composition of stabilizing nano-molecules. One important ingredient is a compound known as glycyrrhizic acid, a natural, sweet-tasting chemical found in liquorice. Unlike other stabilizing approaches used in biopharmaceutical formulations, the nano-coating contains no sugars, sugar-alcohol compounds or proteins that might otherwise interfere with the biological activity of the device. Liquorice or licorice … is the root of Glycyrrhiza glabra from which a somewhat sweet flavor can be extracted. The liquorice plant is a legume (related to beans and peas) that is native to southern Europe and parts of Asia. It is not botanically related to anise, star anise, or fennel, which are the sources of similar flavouring compounds. The word ‘liquorice’/’licorice’ is derived (via the Old French licoresse), from the Greek γλυκύρριζα (glukurrhiza), meaning “sweet root”,from γλυκύς (glukus), “sweet” + ῥίζα (rhiza), “root”, the name provided by Dioscorides. Liquorice extract is produced by boiling liquorice root and subsequently evaporating most of the water, and is traded both in solid and syrup form. Its active principle is glycyrrhizin [emphasis mine], a sweetener between 30 to 50 times as sweet as sucrose, and which also has pharmaceutical effects. The team has tested the nano-coating by coupling and stabilizing an anti-inflammatory antibody, which may be used in therapy, to a porous polyurethane surface. This carrier acts as a surrogate for a medical device. Such a system might be used as a therapeutic implant to reduce inflammation caused by an overactive immune system in severely ill patients. The researchers found that even if the test device is blasted with radiation to sterilize it entirely, neither the nano-coating nor the proteins are damaged by the radiation and the activity of the device is maintained. “This nano-coating formulation can now be applied for the production of improved biofunctionalized medical devices such as bone implants, vascular stents, and wound dressings and will ease the application of biomedical combination products,” Koch explains. There’s no indication as to when this nanocoating will appear on the market. For those interested in the technical details, here’s the open access article, Nano-coating protects biofunctional materials by Rupert Tscheliessnig, Martin Zornig, Eva M. Herzig, Katharina Luckerath, Jens Altrichter, Kristina Kemter, Adnana Paunel-Gorgulu, Tim Logters, Joachim Windolf, Silvia Pabisch, Jindrich Cinatl, Holger F. Rabenau, Alois Jungbauer, Peter Muller-Buschbaum, Martin Scholz, and Joachim Koch can be found in Materials Today (2012) 15(9), 394-404. LEUKOCARE AG, the company the company that developed the liquorice-based coating can be found here. This entry was posted in coatings, medicine, nanotechnology and tagged Adnana Paunel-Gorgulu, Alois Jungbauer, Eva M. Herzig, Georg-Speyer-Haus Institute for Biomedical Research, glycyrrhizic acid, glycyrrhizin, Holger F. Rabenau, Jens Altrichter, Jindrich Cinatl, Joachim Koch, Joachim Windolf, Katharina Luckerath, Kristina Kemter, LEUKOCARE AG, liquorice, Martin Scholz, Martin Zornig, medical implants, Nano-coating protects biofunctional materials, Peter Muller-Buschbaum, Rupert Tscheliessnig, Silvia Pabisch, Tim Logters on October 9, 2012 by Maryse de la Giroday.